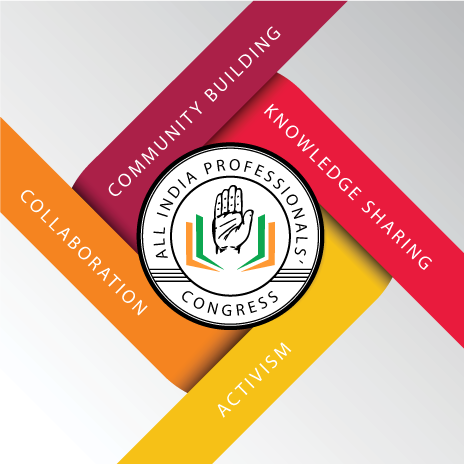 The All India Professionals’ Congress (AIPC) is India’s first political platform focused on the needs and aspirations of working professionals in the country. The idea of AIPC germinated from the assessment that professionals in today’s India are disconnected from politics, a starkly different situation from the first couple of decades after Indian independence. The fundamental purpose of AIPC’s existence is to build an ecosystem centred around connecting our Fellows to the political domain. Our Fellows will help promote AIPC’s core tenets of Liberty, Equality, Plurality and Social Justice and work to achieving these political goals for themselves and millions of fellow Indians. AIPC is a key department of the Indian National Congress, India’s oldest and largest political movement. AIPC’s work will feed into supporting the parent party’s political goals and objectives. Read more about the INC here. We are building a vibrant community of diverse professionals, united by their common interest in progressive politics. Our Fellows are passionate about helping fellow Indians lead a life of dignity and independence. They believe that the biggest enabler of this change is through transformation of political processes to make them more inclusive, liberal and transparent. One of our core objectives is to channelize the expertise of our community of Fellows to resolve complex political and governance challenges facing our country. Conversely, AIPC will provide our Fellows with insights into the functioning of political processes. We create avenues for our Fellows to engage with leaders from the Congress party. This engagement could be a sustained technical collaboration or for a specific program or campaign that the party is promoting. Our Fellows are passionate about political causes, ranging from Environmental protection to issues such as Net Neutrality. AIPC provides Fellows with a platform to carry out political activism.